To say that Priscilla Tsai turned lemons into her own brand of lemonade is an understatement. Cocokind was launched exactly three years ago (in November 2014) by Priscilla Tsai, a former Wall Street investment banker who always suffered from hormonal acne. When prescription treatments weren't helping, she decided to take matters into her own hands and created food-based, all-natural skincare products, mostly starting with coconut oil. She moved back to San Francisco and bootstrapped her company, taking care of every element. Cocokind’s mission? To provide clean, conscious and accessible skincare that empowers women. Today, Cocokind can be found in over 3,000 stockists in the U.S. (including Whole Foods and Bed, Bath & Beyond) and Australia, as well as on its own e-commerce site, cocokind.com. The products are also a hit with beauty and wellness bloggers, who share their Cocokind Collective Sticks on Instagram on the daily. Speaking of sharing, Tsai has built an honest and open community on Cocokind’s social media channels and “The Buzz” blog, which has blossomed thanks to her ability to be an authentic voice (or rather, face) who doesn’t hide behind Insta filters even on her worst skin days. You might be wondering how skincare empowers women. Let us count the ways. For starters, Tsai launched a mentorship program where she gives advice to one female entrepreneur every month, as part of her “Talk To Me” initiative. The 29-year-old founder spoke to us about pivoting from Wall Street to wellness, her three biggest tips for aspiring entrepreneurs, and what she hopes for every woman in this current #MeToo climate. Karin Eldor: Your career path is so unique. Tell us how you went from finance to creating your own skincare brand. Priscilla Tsai: My journey into the skincare world started off as a consumer, not as a career move. I’ve dealt with hormonal acne since I was a teenager. When I was in college, my dermatologist put me on antibiotics and other oral medications, and I took those pills daily for years. I started having major digestion issues, and I realized that there may have been a link between my acne medicine and stomach problems. After quitting those medications, I started looking into holistic solutions for my skin and body. I’ve always been a “DIY” person, making my own clothes, food and now, superfood-based skincare. At the same time, I had recently graduated from the University of Pennsylvania with a finance and accounting concentration. My most recent job before starting Cocokind was as an equity research associate covering food stocks at JPMorgan. While I liked this job, I had always known that eventually, I would want to start my own consumer company. Through covering stocks like Annie’s and Whole Foods, my interest in the organic industry started to overcome my interest in the stock market. My skincare recipes had also completely transformed my skin. That’s basically how Cocokind started. I realized that there was nothing out there to serve my own needs as a consumer (clean, high-quality and affordable), and eventually, solving that problem became more compelling than Wall Street. Eldor: You wear so many different hats at Cocokind. How do you balance it all? Tsai: I started this business basically doing every function possible, so it’s very natural to me to balance different roles all day long. These days, however, I have an amazing team that helps keep me organized. Before I had the luxury of having these teammates, I used the old-school system of a notepad, good memory and prioritization. As for work/life balance, I didn’t have it for the first two years of Cocokind. Other than some limited time with my family and close friends, I worked all the time. I placed a ton of pressure on myself to achieve in the beginning stages of this business, and as a result, I started to sleep less and feel more anxious. To change that, I started developing new routines. For instance, I now make an effort to take at least one full weekend day off email. Since I also manage our corporate Instagram, I’ve had to set some boundaries for myself when it comes to social media. I also created new routines like going to the gym after work. Most importantly, I care about my closest relationships in life (including my employees) more than anything. Remembering that has helped me make more balanced decisions on how I allocate my time. Eldor: We love that Cocokind is all about authenticity, with you posting selfies and Instagram stories on good skin days but also on "breakout" days. Why is authenticity such a key component of Cocokind’s ethos? Tsai: People who know me know that I have always dealt with major skin issues, mostly relating to sensitivities and cystic acne. We don’t talk about the insecurities that come from acne as much as we do about body image issues, but we really should be. I can point to several times in my life when my problematic skin majorly disrupted my life, dictating and impairing how I felt about myself. Through my own products, I’ve thankfully overcome (most of) that mental challenge. We are authentic because I am the first and number-one user of the products. Cocokind has been the most empowering tool for my skin and my mind, and I want our users to experience that too. Eldor: Natural and vegan skincare is such a booming industry today. How do you differentiate Cocokind from other “clean” skincare brands? Messaging. I do all the posting and writing on our Instagram and have this amazing, direct communication path with our consumers. The way I talk about Cocokind is less focused on selling and more geared towards featuring how I actually use the products to help my skin on good days and bad days. Our customers can relate to me, and that relatability is not so easy to come by in the beauty industry. Innovation. 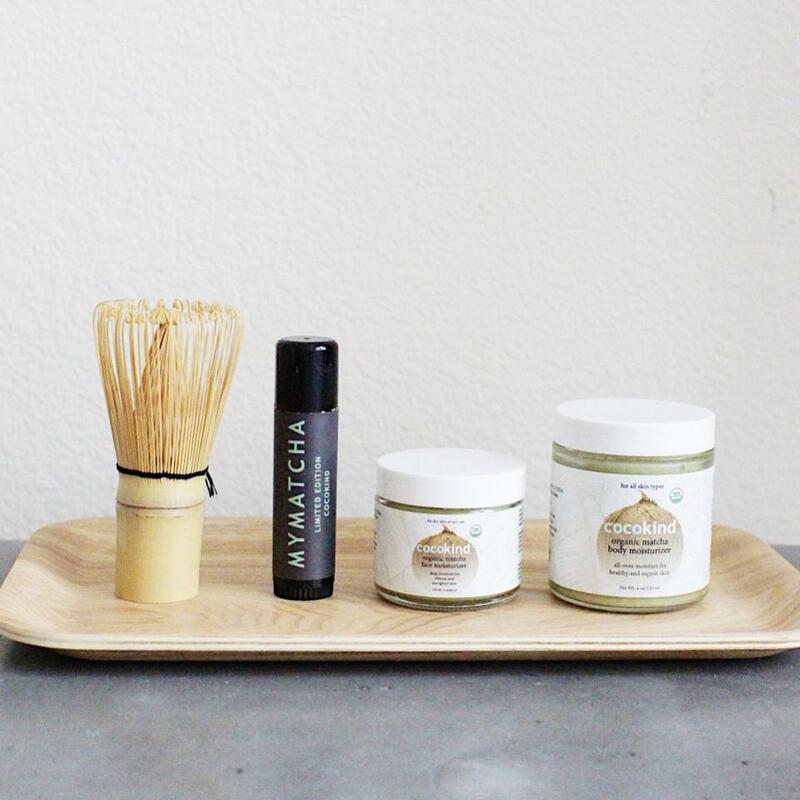 We started using matcha in our skincare products before matcha became “cool.” We have been a leader of introducing superfood ingredients into the skincare world, and we have so much more coming. Accessibility. While there is a huge market for luxury wellness products, that’s not us. We do accessible, everyday wellness. That quality reveals itself in our consumers being able to access me through Instagram, our affordable price points (everything retails for under $20), and where you can find our products (mass market). Eldor: In this era of #MeToo and discrimination against women in certain industries, we love that Cocokind is a female-driven brand. How has your own experience in Wall Street helped fuel your desire to build a female-centric brand? Tsai: My experience in Wall Street has definitely shaped this business. When I worked in finance, I always felt like I had to be smarter and work harder than my male colleagues to prove myself. Feeling confident never came naturally, it was always something I had to fight for. I want the women who work for me to come in knowing that I believe they can do everything and anything.Building their confidence is important to me, because I remember how it felt to be insecure. The 20-plus women at my company can do every role, whether it is sales, marketing, finance, accounting, warehouse, production or fulfillment. We’ve hired men in the past and we will definitely do so in the near future, but for now, I cherish the fact that we happen to be all female. Cocokind’s mission is to empower women through our skincare, so of course, that starts in-house. Eldor: Tell us about your “Talk To Me” initiative. Tsai: I love this initiative! I attended a conference for wellness founders recently and noticed that there were very few women in the room. Many women who follow me on Instagram do so because they are inspired by the business aspect, so I decided to start this initiative where my followers can email business questions to talktome@cocokind.com. Every month, I choose one woman to have an hour long conversation with where we take a deep dive into specific business issues she is encountering. We listen to each others’ struggles and both come away with creative ideas, solutions and most importantly, support. The whole idea is to encourage more women to start amazing wellness companies. Be compelled. If you’re not compelled to do something, you shouldn’t do it. As soon as I decided I was going to make my skincare recipes an actual brand, I was a woman on a mission. Your ideas for your business should compel you to act. Do it yourself in the beginning. People always say that as founders, you should reserve your time for only the highest value tasks and outsource the rest. I don’t necessarily think that’s a good mentality in the beginning stages. When I first started, I spent as much time planning and selling new products as I did physically boxing products. This not only allowed me to save resources, but it also allowed me to know my business well and learn how to solve all types of problems myself – something I needed to do more and more of as I grew. Do it your way. Every business is different, so don’t think you need to follow the same steps as other startups. Eldor: What’s your career mantra? Tsai: Think big, act small. I believe what has helped me the most in my career is the fact that I am a doer. While I have always had big ideas, my brain is naturally geared to figuring out what immediate next steps I need to take to make something a reality. If you think big and try to act big, that can be overwhelming and not realistic. For me, it’s about generating good ideas and then most importantly, executing step by step (and quickly if you can!). Eldor: What’s next for Cocokind? Tsai: As we start our fourth year in business, we have so many exciting initiatives on the horizon. We’ll be launching some key new products in 2018, and we will also be expanding both our online business as well as our retail partnerships. Early next year, you’ll be able to find us in every Whole Foods store in a much bigger way! Personally, I’m most excited to hire new teammates and continue strengthening my relationship with our consumers. I believe our messaging is helping to change the way women feel about their skin and beauty, and that’s an urgent to-do for me.